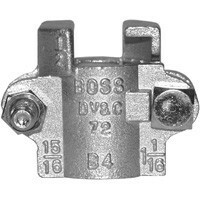 # DIXB10 - Boss Clamp - 2-Bolt Type - Plated Iron - Hose ID: 3/4 in. - Hose OD: 1-32/64 in. to 1-44/64 in. The bolts used in the Boss interlocking clamps are not standard bolts. They vary from standard bolts in their length, diameter, overall thread length and material hardness. These bolts can be retorqued, but it is not recommended that the bolts or clamps be reused, as they are designed for a single bend only. Dixon recommends using only factory supplied replacement bolts. Hose OD 1-32/64 in. to 1-44/64 in.